Many people think of the Square as antebellum Glover Park, donated to the city by its first mayor. However, this attractive centerpiece is just a small part of Marietta Square. From the vintage 1898 train depot, now the Marietta Welcome Center, to the antebellum Kennesaw House, home to the Marietta Museum of History, and a vintage 1880 warehouse that today is home to the Gone With the Wind Museum, Marietta Square extends north to The Root House and across town to the 1909 Post Office that today houses the Marietta/Cobb Museum of Art. 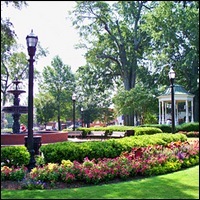 Glover Park was the original site of the Cobb County Courthouse. Today, that modern edifice sits on the southeast corner opposite Glover Park. The downtown area includes restaurants, businesses and professional offices that house a vast array of products and services. Doctors, lawyers and shopkeepers all call the Marietta Square home. Parking: Street parking is available all around the Square in front of the shops.